As morning gilds the sky, the dew caresses plump berries, and the bleats of the flocks echo along the hillside. Day has broken, and there's work to be done. Fruit to be plucked. Flowers to be gazed upon and cut. Herbs rubbed and tasted. Eggs to gather. Sheep to feed and admire. Goats by which to be amused to a tickle. Take a moment to browse our pages to learn about us, what's growing here at the farm & in the gardens, learn about the process of growing berries naturally, discover where to get some of Bramberi's delicious products, find directions to the farm or how to contact us, or take a moment to stroll through the farm & gardens pictorially. Whatever you choose to do, we are glad you stopped by, and hope to visit with you in person! It's what grows here, both intentionally and unwittingly along the forest edge and laced among the blades of grass in the reclaimed pasture. We are a small farm sitting on almost 20 acres outside of Dahlonega in the Foothills of North Georgia, exactly 60 miles as the crow flies north of Atlanta. 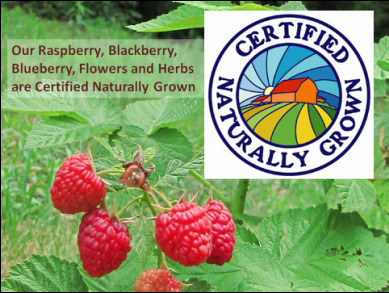 Our focus is to provide high quality, naturally grown berries produced through sustainable and integrated farming practices as part of a network of local and healthy food production. Our First Love here at Bramberi Farm is Raspberries! Don't get us wrong, all our berries (and flowers, and herbs, and shrubs, and livestock, etc) have a near and dear place in our hearts, and we strive to lavish them with all that they need to become fully productive and wonderfully nutritious fruits. We take God's clue on this - He's given us all that we need for Life and godliness. We figure this is the first step in Stewardship. Stewardship is a beautiful concept, actually more of a responsibility, to be wise, careful, and respectful with the Gift that has been entrusted to us, valuing the Giver enough to want to give the Gift back in a way that demonstrates honor, and Worship. We have much to learn on this journey and welcome feedback from those of you who have explored this and would like to share your experiences and gained wisdom. Berries ripening March through November.